Veteran Affairs & DOD: Learn what Arjo is doing to enhance our partnership with patients and caregivers today! Our work is based on genuine care for human health and well-being and contributes to a sustainable healthcare system – always with people in mind. Without leaving the bed, patients who need a graded transition from bed rest to supporting their full body weight can be gradually moved to a standing position at the touch of a button, to aid rehabilitation from early in the acute phase of critical illness. 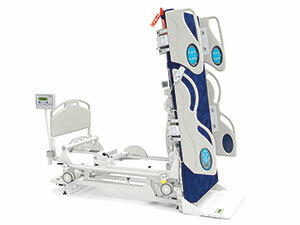 The Sara Combilizer is a safe multi-functional aid that helps facilitate early out-of-bed mobilization, rehabilitation and care for patients previously deemed high risk or inappropriate to mobilize. 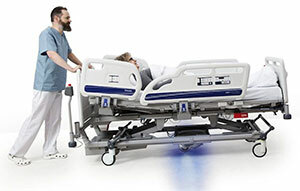 Transporting patients in hospital beds is a common patient handling task that can pose significant ergonomic risks for involved caregivers. 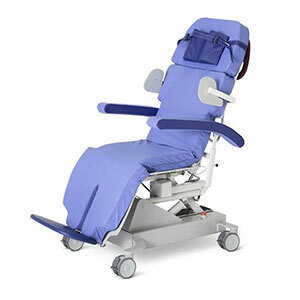 For hospitals looking to reduce ergonomic risk and support efficient workflows, IndiGo is the powered fifth wheel that aims to offer a helping hand in order to make every transport as safe, controlled and simple as possible.